It's St. Patrick's Day today and I was enjoying it at 6am this morning while piping icing onto a clients batch of shamrock shaped cookies I was madly finishing off for there 8am delivery. It would of been fine if I'd had a little extra warning, but that's not how the catering business works and I'm almost going to change the company name to www.lastminutecatering.com- however, this is another story for another day! 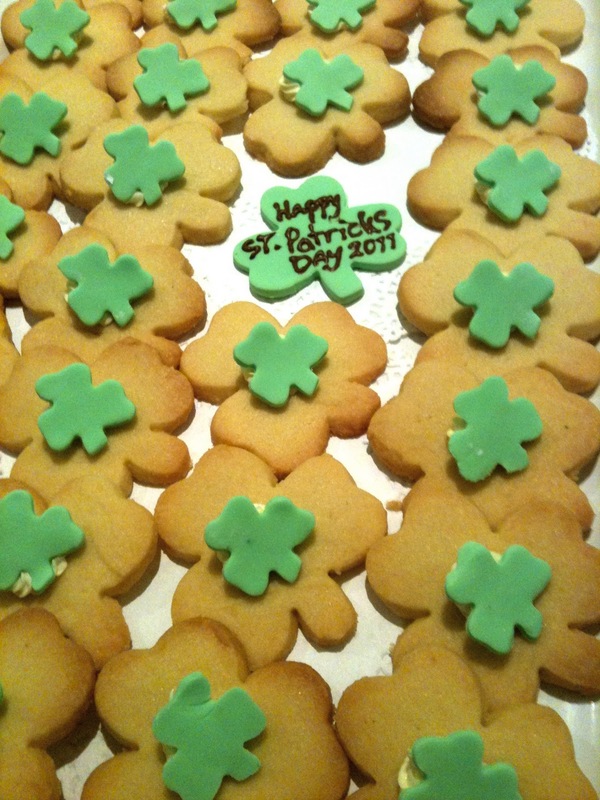 When I was asked if I'd make 120 cookies shaped in the shamrock pattern for St. Pats Day, I instantly thought of a great cake supplier I use for bits and pieces, I was so confident she would make them that I said, no problems! It was at this time when I knew I'd have to do it myself. It's not that I'm lazy, it's just that I didn't really have a great recipe in mind, and I thought if I have to make 120 of them, then I'd want to get the recipe right the first time. I'm sure everyone understands the frustration of following a recipe and then being bitterly disappointed when your final result doesn't taste or look anything like you were hoping for? I was airing my opinion (what a surprise!) to one of the guys at work when he told me about a great shortbread recipe he had used once. I paid attention because Dean knows a lot more about the sweet side of a kitchen than myself and I was after all the help I could get. I have to say, after looking at the recipe and then taking Deans advise on the sugar (meaning split the sugar quantity into half icing sugar and half castor sugar), I was feeling kind of confident. I love shortbread and I was not disappointed in this recipe- IT ROCKS! In fact he whole page was brilliant. I simply clicked on the amount of cookies I wanted to make and it did the calculation for me. 6 cups of butter and 7 odd cups of flour is a lot of cookie dough people! The only way I could think of making these better would be to use Kerry Gold salted butter, but seeing as I can't get it here, I had to make do with everyday Australian butter (and believe me, if you have ever eaten Kerry Gold, you will understand my insistence). I really was running out of time and there was no way I was mucking around with flooding the cookie with green icing, so with Deans help we coloured some fondant, got out the small cookie cutter and started cutting out green shamrock leaves. They needed to be hard so they would stand up on the shortbread so we left the leaves out to dry over night. At 6am this morning I whipped up a quick and simple butter cream, piped a wee spot in the middle of the shortbread cookie to hold the green leaf on ( I was also hoping they would look a little more interesting for my clients) and then put them in the van and sent them on their merry way. All in all, I was glad I had to make them, otherwise I wouldn't of found out about this great recipe. Now I'm off to the pub to pick up a couple cans of Guinness for the hubby and I tonight! What great looking cookies! I love shortbread too. You crack me up with "lastminutecatering.com" people used to drive me crazy. I can't count the number of times someone would book a room a year ahead and then give the caterer 2 days notice.